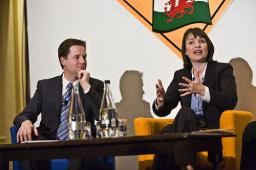 Why don’t the Welsh Lib Dems join forces with Plaid Cymru? Now that Nick Clegg has managed to ruin the credibility of the Lib dems for probably about a hundred years, isn’t it time for the Welsh Lib Dems to quickly work out the best way to leave the listing Lib Dem ship and either be the first of the unionist parties in Wales to do the mature sensible thing and break away from the distatrous pantomine politics of Westminster, or merge with Plaid Cymru to create a formidable independent Welsh party that can really stand up to the Labour/Conservative dinosaur parties in Cardiff Bay, who still, amazingly, seem in awe of the highly paid actors telling them what to do in London. Like turkeys voting for Christmas. Over and over. Kirsty Williams is one of the best speakers in the Senedd – she deserves better. Surely the Welsh Lib Dems can see that they are being seriously held back and pulled down by the London Lib Dems and have nothing much left to lose. If they did the sensible thing and split from the archaic union party system, the only way for them would be up.